Aloha! 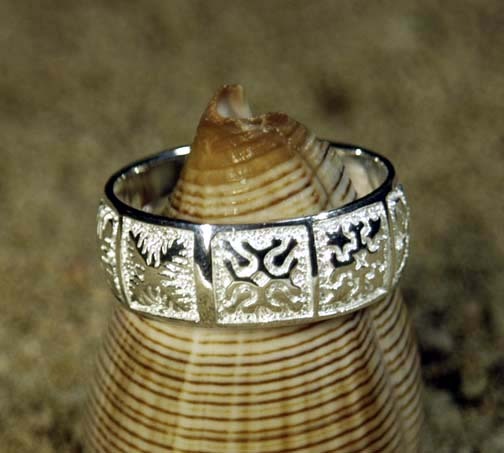 It is a pleasure to offer you a beautiful selection of high quality Hawaii solid 925 Sterling Silver Jewelry at lower prices than can be found in most fine Hawaii jewelry shops. Our Hawaiian sterling silver jewelry includes bracelets, bangles, earrings, pendants and rings made of "925" sterling silver. This collection of outstanding jeweler designed pieces include some with raised accents in Copper plated or baked on black enamal. 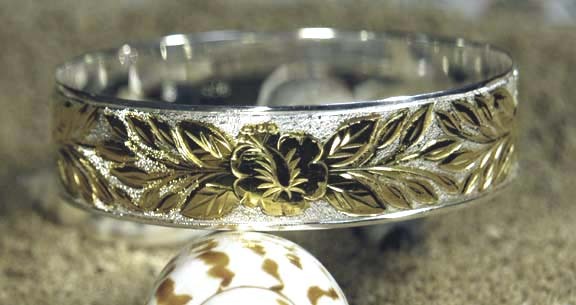 All the Hawaiian Sterling Silver Jewelry collection designs here were inspired by Hawaii's natural paradise setting and were created and copyrighted here in Hawaii and sent to China to manufacture. Hawaiian Sterling Silver Bracelets, rings, pendants and earrings we offer you reflects Hawaii natural beauty in this refreshing new collection of fine "925" sterling silver jewelry. Our Hawaiian Sterling Silver jewelry displays tropical fish, dolphines, turtles, ocean waves and coral. And representing natures beauty on land are native flowers including plumeria, hibiscus, anthurium, roses, and bird of paradise along with treasured traditional Hawaiian quilt designs representing floral, fruit and plant designs found here in the islands. You will also find the popular inscription "Kuuipo" which is the Hawaiian word for "Sweetheart" and is given to someone you love dearly. Every piece is made of "925" Solid Sterling Silver. Every item comes with a 30 days return policy so you can buy with complete confidence. *To keep your silver jewelry looking new we recommend using a soft cotton cloth to gently wipe off your .925 Sterling Silver Jewelry's excess make-up and skin oils after each wearing. You can use silver cleaner or warm water with some baking soda to clean tarnished silver jewelry, but never use chlorine bleach, do not wear your Silver jewelry when you go into a swimming pool. Clean and polish the Jewelry before storage. *Please note, this jewelry are not designed to be worn all day and night like other expensive rings as the copper accent-plating can wear down or tarnish. The gold plate on two-tone rings or black enamel on other rings can wear off from frequent exposure to body lotions, oils, soaps, shampoo and conditioners, detergent, chemicals like chlorine in tap water or in swimming pools etc. It is recommended to clean these substances off from time to time with silver cleaner or warm water with baking soda. These rings have the look of expensive silver/gold jewelry that can cost up to $200 or more. These rings are currently priced very low.